RIT students Josh Deichmann, left, Erik Lydick and Patrick Pistor received an Apple Design Award, recognizing their game Dividr, as one of the best apps of 2016. A game developed by three Rochester Institute of Technology students has been named one of the most well-designed apps of 2016, according to Apple. 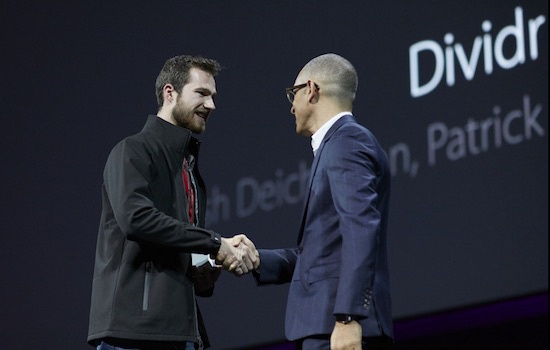 The game app, called Dividr, took home an Apple Design Award at the tech giant’s Worldwide Developer Conference (WWDC) June 13 in San Francisco. Apple gives out 12 Apple Design Awards each year—10 to professionally developed apps and two to student apps. The annual awards are meant to recognize independently developed apps that raise the bar in design, technology and innovation. 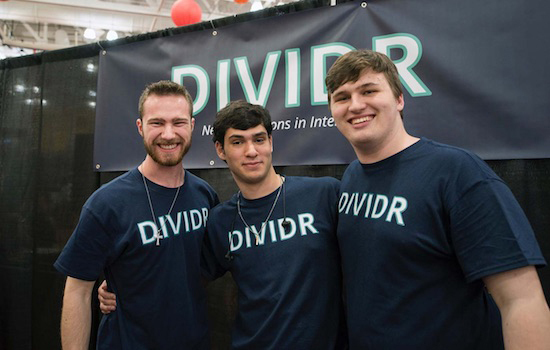 Dividr was created by Josh Deichmann, a third-year computer engineering major from Belmont, N.Y.; Patrick Pistor, a third-year web and mobile computing major from Otego, N.Y.; and Erik Lydick, a third-year mechanical engineering major from Blue Bell, Pa. Their app was selected out of 350 entries for the student award. The team received a trophy and international recognition. Within a week of winning the award, downloads of the Dividr app have jumped from about 400 to nearly 12,000. The student team created Dividr as part of the 2016 RIT iOS App Challenge, an Apple-sponsored hackathon hosted in February at RIT. The goal of the retro 2D arcade game is to move the main player in and out to avoid obstacles on the map and collect coins along the way. You move the player by applying more or less pressure with your finger to the screen. After winning first-place at the RIT competition, the team released the app on the App Store at the Imagine RIT: Innovation and Creativity Festival May 7. Deichmann also entered the WWDC Scholarship to win a free ticket for the week-long event for developers. As part of the scholarship application, Apple asked that he submit an iPhone app he had previously made or a new app he was working on. Out of 350 scholarship winners, two apps were chosen by the company for a Student Apple Design Award. Deichmann attended the ceremony June 13 in San Francisco. In the future, the team plans to fix any bugs and work on improving the app. They hope to one day make it to the featured front page of the App Store. To download the free Dividr app, go to the App Store.